Plum trees (Prunus spp.) are generally small to medium-sized trees that produce sweet, edible fruits. Plum fruits can range in skin color from deep blue to yellowish or orange. Several plum tree species have red fruits, however. Plum trees grow in a wide range of climates, and most survive deep freezing temperatures in winter, unlike many other species of fruit trees that are more frost-tender. Plum trees are popular ornamental and fruit trees in landscapes around the world. You can identify red plum trees by studying their unique characteristics. Identify the red plum tree by its overall size. The American (P. Americana) and Canada (P. nigra) plum trees grow 10 to 30 feet tall with a 5- to 12-inch-diameter trunk, while the purpleleaf plum (P. cerasifera) grows up to 25 feet tall and wide. The Methley plum tree (P. salicina) reaches a height and spread of only 10 to 20 feet, while the Mexican plum (P. mexicana) grows 15 to 30 feet in height and 20 to 25 feet wide. Study the leaves to identify the red plum tree. The American plum has non-lobed leaves edged with fine, sharp double teeth and curved leaf veins, while the Canada plum’s leaves have blunt teeth along the leaf edges. The Methley plum tree’s leaves are oval to elliptical with wide tips and fine teeth along the leaf edges, while the purpleaf plum has distinctly deep-purple leaves that ate 1-1/2 to 3 inches long. Look at the flowers to identify the red plum tree. The purpleleaf plum tree’s early spring flowers are pink and white, while the Mexican plum’s white, showy blossoms emerge in February and March. The Methley plum’s white flowers bloom in late winter or early spring, while the American plum tree blooms in clusters of tiny white flowers with yellowish stamens in spring. Identify the plum tree by its red fruits. The American and Canada plum trees bear loose clusters of blue or red fruits that are more than 1 inch in diameter, while the Methley plum produces medium to large fruits that have purplish-red skin and a round to conical shape. 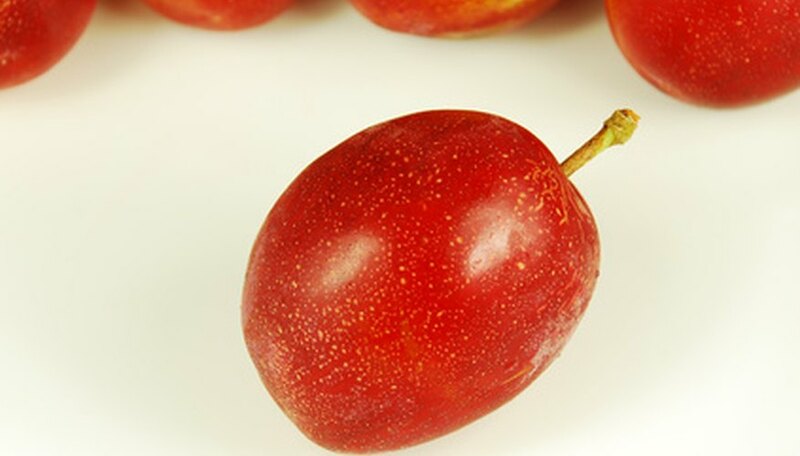 Mexican plums bear small red fruits, while the purpleleaf plum tree’s fruits are round, reddish and 1-1/4 inches in diameter. Also notice where the red plum tree is growing to identify it. The purpleleaf plum tree typically grows in full sunlight, a wide range of well-draining soil types and in all but the coldest climatic regions, but the Methley plum tree cannot grow in regions where winter temperatures dip below -15 degrees Fahrenheit. The Mexican plum tree is even more cold-tender and cannot grow in areas with temperatures below -5 degrees. The American and Canada plum trees are native to North America, but the Canada plum is found growing only in Canada and the northern parts of the United States. Don't confuse the American plum with the Canada plum tree, both of which have very similar characteristics. The American plum tree's twigs are orange-brown in color, while the Canada plum's twigs are greenish.